Quezon City, a premier metropolis, is also a city of mysteries. When the previous city administration ended its reign, it boasted of a P6.5-billion budget surplus. Its former mayor, a staunch pillar of the previous regime — now vilified to the hilt — has moved on anew to become Speaker of the House under the supposedly rival political faction of BSA III. Such increases will naturally raise new needless billions from the city’s citizens, who know full well that these city councilors each enjoy an annual P43-million pork barrel, which will never be properly accounted for. Yet, despite the citizens’ opposition, these city councilors are pursuing it with shameless determination, apparently confident that nothing but nothing can stop them — not even the citizens’ threat to raise such questions of their “pork barrel” and the “lost surpluses” in the proper forum. Citizens are therefore asking what exactly is happening in Quezon City that it can be so smug to the inquiries and how so huge an anomaly as the missing P6.5-billion surplus can be swept under the rug. To understand this, one has to look at the “new” city hall. There may be a new mayor but he is all but powerless against the old regime, which continues its tight grip over the city. The current vice mayor is Belmonte’s daughter. The city administrator today used to be city treasurer under him as well while the old cabal around him then is still in control. Corruption there is neatly worked out, with everyone in the loop allegedly approving papers; and with councilors, congressmen, and city officials concerned allegedly getting their share of whatever allotted portions there are. But how do these graft activities get around the rules designed to check corruption? We’ll have to look at the Commission on Audit (CoA) auditors. For sordid graft activities in an institution to thrive, it is inevitable that the CoA officials assigned are also in collusion. Examining who the auditors are in the city today sheds light on what’s going on in the city administration. Plus, to understand Quezon City today requires a thorough review of the historic scandals in Philippine government, such as the Gen. Carlos Garcia Armed Forces of the Philippines (AFP) logistics plunder case that shocked the nation, which led to the shameful “suicide” of Gen. Angelo Reyes. State auditor Warren, who was alleged to have received the biggest amount, was reactivated and transferred to Quezon City Hall. This contradicts an earlier position of the CoA chief, Grace Pulido-Tan, who correctly preferred to “freeze” the accused state auditors. A change of heart reportedly occurred only after she was called into a meeting in Malacañang. What happened in the supposed meeting, no one really knows, but one of the “most guilty” auditors charged in that AFP plunder case was in fact reactivated, and to Quezon City Hall at that. Tan’s confirmation as CoA chief was reportedly opposed, but apparently Tan’s stay has been prolonged. Has there been a quid pro quo? Quezon City Hall is a nest of graft and corruption. If its resident CoA auditor will have a questionable reputation, then QC’s citizens can be assured that the rats will play. Is the CoA in collusion or is it going to help save the city and its citizens from the continuing rapacity of corrupt politicians and bureaucrats? Let’s see if Grace Pulido-Tan can overcome fears of the old Quezon City mafia and help clean up the country’s premier metropolis by ending the “CoA-llusion” there. So who’s the “maleficent genius?”, as the Senate’s Lady Miriam would call the person behind the “Pajero bishops” media blitz that ended up a dud and was exposed as a well-crafted attack on the Church leaders intended to divert public attention from the real issue at hand? Zaldy Ampatuan and Lintang Bedol’s “confessions” on the 2007 senatorial election cheating just don’t sound right — almost as if portions of the “admissions” were intended to give Noynoy Aquino the “ammunition” to go after his predecessor. To be clear: This is not to say that the elections in Maguindanao, whether in 2004 or 2007 or even 2010, were fraud-free and that the winners were really the genuinely elected officials by the Maguindanao electorate, but what appears out of place — confession wise — was the inclusion of Noynoy being targeted by Gloria for zero votes, with Zaldy saying that Noynoy’s parents are popular and that he may be running for the presidency in 2010. “He [Aquino] would know what to do. Now is the opportunity to act on the cases of enforced disappearances. I hope he grants this opportunity to show the world that he is sincere in helping victims of human rights violations find justice. He must act immediately,” Mrs. Burgos said. MANILA – After hearing the news, Mrs. Edita Burgos felt initial euphoria. She said the Supreme Court decision proves the family’s theory that the military was behind the abduction of her son Jonas. In an en banc resolution dated July 5, the high court upheld the findings of the Commission on Human Rights and has directed the military to produce Jonas Burgos. The members of the high court unanimously concurred with the resolution written by Associate Justice Arturo Brion. 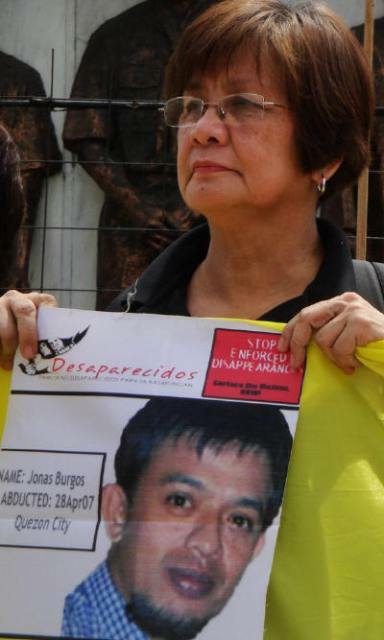 Burgos was abducted April 28, 2007 while he was having lunch at a restaurant inside the Ever Gotesco Mall in Commonwealth Avenue, Quezon City. “The decision is a welcome development in the campaign to stop impunity and to make the perpetrators of human rights violations accountable for their crimes. We are glad that the SC seems to be delivering a message that is loud and clear – that it is now time, belated as it is, to give justice to the kin of those missing like Jonas Burgos and the two university students,” Edre Olalia, National Union of Peoples’ Lawyers (NUPL) secretary general, said. Mrs. Burgos said that as commander in chief of the Armed Forces of the Philippines (AFP), the ball is now in the hands of President Benigno S. Aquino III. “He would know what to do. Now is the opportunity to act on the cases of enforced disappearances. I hope he grants this opportunity to show the world that he is sincere in helping victims of human rights violations find justice. He must act immediately,” Mrs. Burgos said. In the same vein, human rights group Karapatan called on Aquino to use his power as commander-in-chief of the AFP to order the military to abide by the Supreme Court’s order to surface Jonas Burgos and ensure that those responsible for his abduction and disappearance will be punished. “Only then can decisions of the Courts have teeth and effect the lessening of, if not totally ending, impunity,” Karapatan said. MANILA – In a rare occasion, Coni Ledesma, the former nun turned revolutionary, spoke about women, the revolution and the peace process. 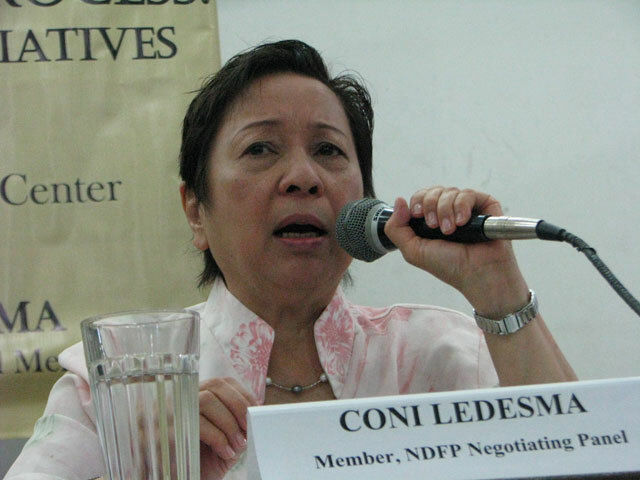 Ledesma, member of the National Democratic Front of the Philippines (NDFP) peace panel, started by providing the context to the more than four decades of civil war. “We are not a mere rebel group. We fight for a Philippines that has genuine democracy, justice,” she said in a forum organized by Working for Empowerment and Good Governance Institute, Inc. (WeGovern). “We see inequality. Yesterday, I just saw the properties of the Ampatuans — 743 bank accounts, 132 motor vehicles, 113 houses and lots. So much wealth! At the same time, there are people who live by scavenging. The gap [between the rich and the poor] is so wide,” Ledesma said. She cited how the farmers and workers are exploited, how overseas Filipino workers work hard to feed their families. “This is our situation. The NPA [New People’s Army] was organized to fight for the rights of the people. The government says without the NPA, there would be peace. That is not true. It is the situation that gives life to the NPA,” she said. Founded on March 29, 1969, the NPA is the armed wing of the Communist Party of the Philippines. “It’s never right to live in fear. Those who attack the civil, political and human rights of the Filipino people thrive on fear and persist in their attacks because of a culture of impunity. To remain silent is to play along with your own victimization,” says human rights advocate Ma. Isabel Aquino Refusing to live in fear: portrait of a human rights defender. It has been almost three decades since the downfall of the Marcos dictatorship, but Maria Isabel Aurelia Aquino’s psychological wounds caused by her experiences during those dark days remain as fresh as if they were inflicted yesterday. In her day to day dealings, however, she is able to be sincere to her facade of cheerfulness and calm. A human rights activist, she knows that fighting for human rights takes courage and persistence. “But it also takes much personal strength. It’s not always easy to put up a brave face when your work is about defending other people’s rights to live in dignity and to stop physical abuse and exploitation. It can take a toll on you, the knowledge of how so many Filipinos are forced to live not knowing their rights or having their rights violated in a myriad of ways. And then when you consider your own experiences, it’s sometimes gets even harder,” she said ruefully. Born in Manila to an upper middle class family, Ma. Isabel grew up in an old Spanish house along Severino Street near Claro M. Recto Avenue in Manila. It was an area that saw many street protests and battles between anti-Marcos activists and the Metrocom (now the Philippine National Police), and a stone’s throw away from Don Chino Roces bridge, or more popularly known as Mendiola bridge. She attended a private school nearby, and in the countdown to martial law and in the beginnings of the First Quarter Storm Movement, she became an activist leading students in the struggle against the dictatorship. “There are those who would say that the days of dictatorship are long gone; but from the state of human rights in the Philippines these days, it is impossible to dismiss the truth that much remains to be desired by way of bringing genuine justice in the country,” she said. Data gathered by Karapatan human rights organization for the second quarter of the year show the same growing list of human rights violations under President Benigno Aquino III’s Oplan Bayanihan (OPB), his administration’s counterinsurgency program which is deemed no different from the previous Macapagal-Arroyo regime’s Oplan Bantay Laya (OBL). From July 2010 to June 2011, a shocking 48 activists have fallen victim to extrajudicial killings while three others have become victims of enforced disappearance. Maria Isabel herself almost became a statistic back in March 2010. 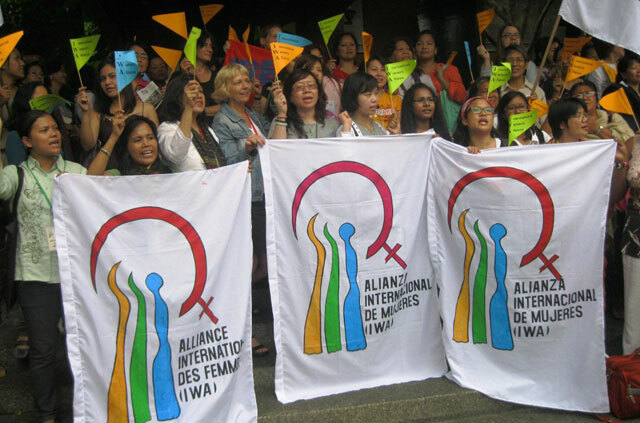 MANILA – In a historic gathering, more than a hundred women from seven continents representing more than 40 women’s organizations worldwide attended the first general assembly of International Women’s Alliance (IWA) in Manila early this month. With the theme “Advance global anti-imperialist women’s movement in the 21st century, strengthen the international women’s alliance,” progressive women from 20 countries vowed to fight imperialist attacks against women’s rights and welfare. IWA is a global alliance that is anti-sexism, anti-racism, anti-patriarchy, anti-feudalism, anti-xenophobia and anti-homophobia grassroots women’s organizations, institutions, alliances, networks and individuals, committed to advancing social and national liberation. Delegates to the IWA pointed out that the global economic crisis made women and the peoples around the world suffer from landlessness, poverty and hunger. In particular, women belonging to the marginalized sectors are the ones most vulnerable to the crisis. Mari Boti of Women of Diverse Origins and an award-winning film maker from Canada said that the first general assembly of IWA aims to further strengthen the collective voice and actions of women’s rights activists. MANILA – Hundreds of activists from 42 countries called on President Benigno S. Aquino III to give up Hacienda Luisita and distribute the land for free. 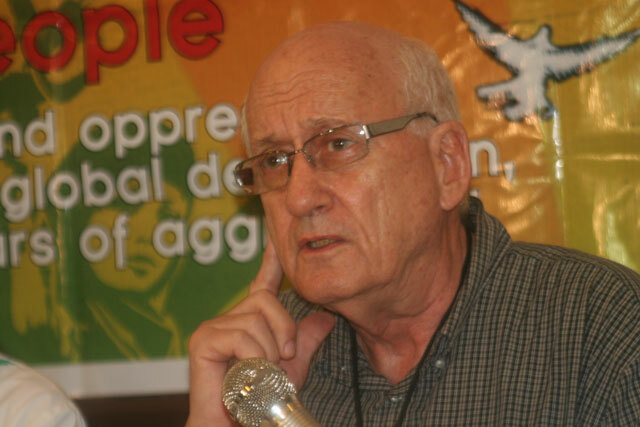 Speaking in a press conference, Prof. Gill Boehringer, a law professor from Australia, called the injustice to the farm workers as “basically theft” and compared the Philippines to Cuba. “Fidel Castro’s mother did not speak to him for a very long time because when he became president, the first property to be nationalized was the Castro plantation. What happens here? It’s exempted. That’s supposed to be comprehensive agrarian reform program. CARP [Comprehensive Agrarian Reform Program] is crap. It’s a terrible situation to have the president [Cory Aquino], and then the president’s son [Noynoy] who also became the president, supporting that kind of fraud on the people, it’s basically theft,” Boehringer said. 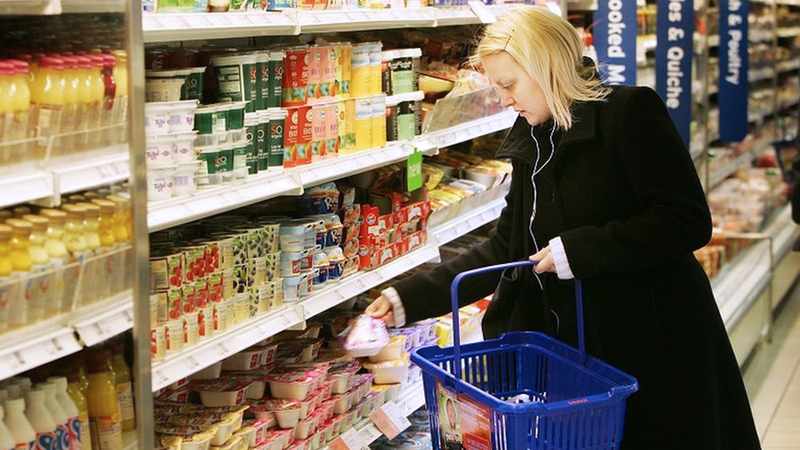 Under CARP, non-land transfer schemes such as stock distribution option (SDO) are allowed. The Palace flatly rejected the offer of former Autonomous Region in Muslim Mindanao (ARMM) Gov. Rizaldy “Zaldy” Ampatuan, one of the prime suspects in the Maguindanao massacre that happened in 2009, to turn state witness after Palace officials faced outrage from families of the victims over suggestions that President Aquino is considering the offer. Justice Secretary Leila de Lima, at a Palace briefing, said the Department of Justice (DoJ) position in rejecting Zaldy Ampatuan as a state witness in the case stands which got the support of the Palace. De Lima, nevertheless, said the government can consider Zaldy as state witness in cases other than the massacre charges such as allegations of fraud in the 2004 elections and the plunder and tax evasion cases filed against the Ampatuans. On top of the questioned hundreds of millions of pesos of intelligence funds spent by Philippine Charity Sweepstakes Office (PCSO) months before the 2010 presidential elections, its embattled former general manager reportedly managed to encash checks totalling P102 million which charge she refused to explain to senators. Alongside this development, Senate probers were also told that records pertaining to the additional P54 million intelligence funds of the agency in 2007, also an election year, appear to be “missing” or unaccounted for as there exists no records to support its disbursement. Former Commission on Elections (Comelec) Chairman Benjamin Abalos Sr. and Commissioner Nicodemus Ferrer yesterday categorically denied massive cheatings in both the 2004 and 2007 elections nor have they had any hand on any election cheating if there were any as alleged by former Comelec election officer for Maguindano, fugitive Lintang Bedol. At a press briefing held in Mandaluyong City, both Abalos and Ferrer denied Bedol’s allegations that there was massive election fraud in the 2004 and 2007 elections in Maguindanao which Bedol alleged, was ordered by former President and now Pampanga Rep. Gloria Arroyo and implemented by Abalos, Ferrer and another Comelec commissioner, Rene Sarmiento. The British government has warned its nationals against the dangers of kidnapping in the Philippines and asked them to postpone unnecessary travel to some parts of Mindanao following the abduction of two American citizens and a Filipino in Zamboanga City early this week. In its updated advisory, the UK Foreign and Commonwealth Office (FCO) discouraged British travelers from going to southwest Mindanao and Sulu and to postpone non-essential travel there. “There is a threat from kidnapping in the Philippines, particularly in the southern Philippines,” it said. The Vatican’s official representative to the Philippines, Archbishop Giuseppe Pinto, will arrive today in Manila to fill in the post vacated by former Papal Nuncio John Joseph Edwards. Most Reverend Pinto is scheduled to arrive this morning aboard a Cathay Pacific airways flight from the Vatican via Hong Kong. Cathay flight CX907 is scheduled to arrive at the Ninoy Aquino International Airport at 9:55 a.m.
San Juan Rep. Joseph Victor “JV” Ejercito yesterday said the bishops of the Catholic Church should not be faulted for receiving donations from the Arroyo government. Ejercito, who was at a media forum yesterday, said the prohibition to donate is on the officials of government and not on the leaders of the church. “We should not blame the bishops because it is the Arroyo administration that corrupted them,” Ejercito said.